Mardi Gras. What’s that? Fat Tuesday? Not around here. In one of my first posts I shared my low-calorie shrimp jambalaya with egg noodles recipe with you all, but I thought I would push myself to make it EVEN healthier. And what can be healthier than salad? I assure you this salad is still full of zesty flavor, filling and super quick to prepare (I made this in less than 30 minutes). A triple threat. In fact, I nearly lifted my shirt it was so good, but then I decided to just keep it on. I have enough of those stinkin’ beads already (yes, that was a bad Mardi Gras joke). As I’ve mentioned before, I don’t really measure ingredients, but rely on my good ol’ fashioned taste buds. I encourage you to do the same with this recipe as you really can’t mess it up. No, really, you can’t. This jambalaya requires four simple to prepare parts, made in the following order – homemade Cajun salad dressing (I’ll admit this is quite close to tasting like a Greek dressing, but it uses a basic Cajun seasoning mix – so, it’s Cajun! ), seasoned croutons, jambalaya flavored shrimp and salad fixin’s. I added a few croutons on the salad because I had some day old bread to use up, but if you want to lighten this up even more than just omit these or substitute with some pepitas for some added crunch and nuttiness. In the future I might switch out the croutons for some quinoa for some added protein. Yum. Yum. Now let’s get started. Make the dressing first and set aside. If time allows, make a day ahead to let flavors meld together. 1. Mix all ingredients in a shaker bottle or mason jar. Taste and add more seasoning if needed. Set aside while you prep the rest of the salad ingredients. Keep leftovers in refrigerator. 1. Preheat oven to 375°. Line baking pan with foil. Place bread cubes in a bowl and drizzle with olive oil. Add seasonings and toss to coat. Spread out in a single layer on foil lined pan and place in oven. Bake until golden brown with crunchy texture – approximately 5 minutes. Keep an eye on these babies so they don’t burn 🙂 Take out of oven and set aside to cool. 1. Place shrimp in a bowl and toss with dried herbs and a couple of dashes of Worcestershire sauce. 2. Heat up a skillet to medium heat and melt butter. Add in garlic, celery, tomatoes and jalapeño and cook for a few minutes until tomatoes start to get mushy. 3. Add shrimp into cooked vegetables, turn down heat and mix to coat. Add salt to taste. Cook shrimp JUST until they turn pink and then remove from heat. Do not overcook. After you have prepared the Cajun salad dressing, jambalaya flavored shrimp and the croutons (unless omitting). 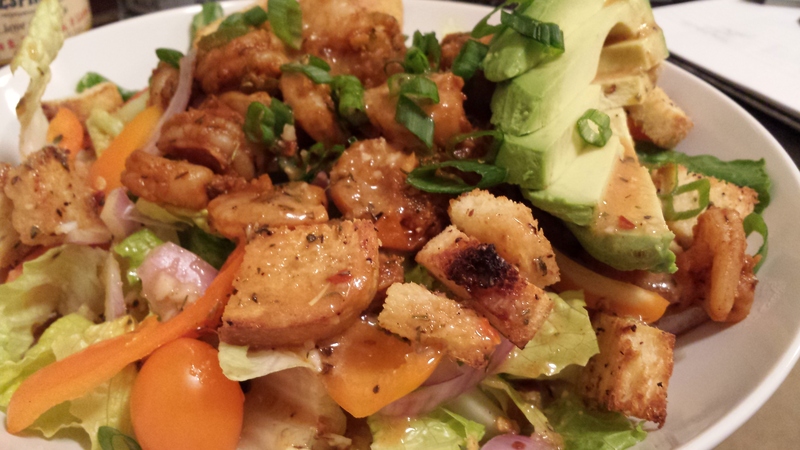 Put the salad fixings in the bowl and layer on the shrimp and croutons and drizzle with yummy Cajun dressing. Stand back and admire. Take a picture or two. Post to Instagram and taunt your friends with the delicious healthy meal you just made. Oh, and then eat the damn thing! Posted in Palate Pleasers, Weeknight Dinners and tagged cajun cooking, cajun salad, cajun salad dressing, Cajun seasoning, cajun spices, clean eating, creole salad, croutons, dinner salad, extra virgin olive oil, Fat Tuesday, healthy jambalaya, healthy mardi gras recipes, healthy shrimp jambalaya, Jambalaya Salad, low calorie jambalaya, Mardi Gras, mardi gras clean eating, ragin' cagin', salad dressing, seasoned croutons, shrimp jambalaya, Shrimp Jambalaya Salad, tasty salads. Bookmark the permalink.